This grilled asparagus salad is delicious on its own, as a side to some grilled or roasted meat and super with a salmon steak. We quite like it on chargrilled, sliced Ciabatta with a poached egg on top and drizzled with a little extra olive oil. Preheat heat a grill, ridged griddle or barbeque. 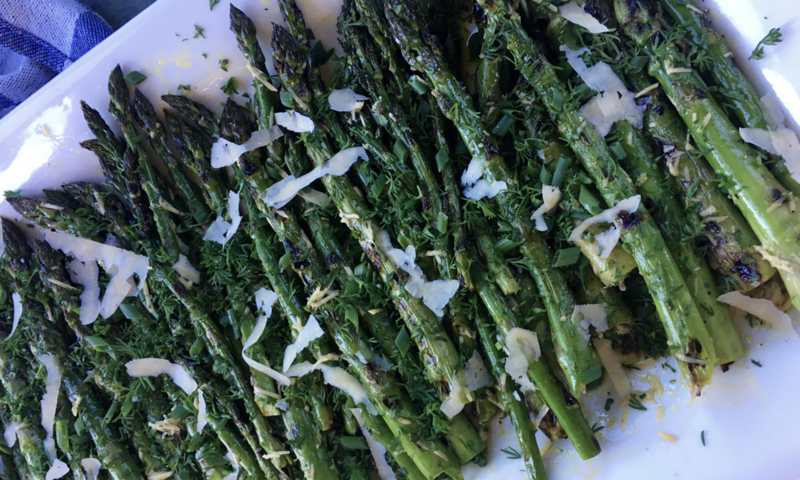 Break the ends off the asparagus and pour a little olive oil into your hands and rub each spear all over with oil. Cook the asparagus on your chosen heat source, turning until marked with grill marks all over. The asparagus should be tender, but still have some crunch. While the asparagus is cooking, prepare the dressing. Place the Parmesan, lemon juice, salt and pepper in a small bowl. Whisk in Dunford Grove Extra Virgin Olive Oil. Taste and add more seasoning if required. Place the cooked asparagus on a platter and toss through the dressing. Arrange the spears nicely and sprinkle over the chopped herbs. Sprinkle over a little more sea salt and a few grinds of black pepper. Finally, using your potato peeler, shave over the Parmesan cheese.